I have presented lectures and workshops to universities and institutions throughout the country, including numerous conference presentations. A sample list of some of these can be found at the bottom of this page. Often times people will ask me about my lectures, presentations, classes, and creative processes. Here are some video links to answer these questions and give you an idea of what its all about! Drawing in Design: Discovery or Illustration? "Our salvation lies not in knowing, but creating." This workshop is designed to spark the magic of creativity. Exercises concentrate on perception and the activation of the design process. Visual stimulation is enhanced with a series of unique exercises that allow the participant to animate their design ideas. A site-specific location is the setting for exercises in; panoramic drawing, and sequential story boards. Flip books are created and constructed to animate the conceptual design stage. Each participant summarizes their process with the construction of a pop-up book. "The eye cannot truly see what the hand cannot draw." Watercolor it's as easy as 1, 2, 3. "Energy, Fantasy and Form," Cal Homecoming, University of California, Berkeley, October 2004. "Garden and Climate," Builders Booksource, Berkeley CA, May 2002. "Drawing and the Creative Process," Virginia Polytechnic State University, Blacksburg VA, April 2002. "Energy and the Garden," Ball State University, Muncie IN, Fall 1996. "The World of the Third Dimension," University of Kentucky, Lexington KY, Spring 1996. "Energy, Fantasy and Form: The Gardens of Chip Sullivan," University of Colorado, Denver CO, 1995. "Gardens of the Four Elements," San Francisco Art Institute, San Francisco CA, 1994. "Climatics of the Garden," Catholic University, Washington DC, 1994. "Energy, Fantasy and Form: The Gardens of Chip Sullivan," University of Illinois, Champaign-Urbana IL, 1994. "Energy and the Garden," University of Arkansas, Little Rock AK, 1993. "Gardens Through Art and Energy," Corcoran Gallery of Art, Washington DC, June 1992. "Landscape Parts," School of Architecture and Allied Arts, University of Oregon, Eugene OR, 1992. "Garden Specimens," School of Architecture and Landscape Architecture, University of Toronto, Toronto Canada, 1992. "Experimental Gardens," University of Washington, Seattle WA, April 1991. "The Works of the Bizarre," Cal Poly State University, San Luis Obispo CA, 1991. "Energy in the Garden," School of Architecture, McGill University, Montreal Canada, 1990. "Energy and the Garden" and "Landscape as Tattoo," Department of Landscape Architecture, Rutgers State University, NJ, 1990. "Landscape as Tattoo," Department of Landscape Architecture, University of California, Davis CA, 1990. "New Forms of the Garden," College of Architecture, State University of New York, Buffalo NY, 1989. "Landscape as Art," Department of Landscape Architecture, University of California, Davis CA, 1989. "Garden and Reliquary," Tampa Bay Chapter of the American Society of Landscape Architects, Gillman-Stein Gallery, Tampa FL, 1988. "Current Work," Overview Seminar, Graduate School of Design, Harvard University, Cambridge MA, 1987. "Energy, Fantasy and Form," College of Architecture, University of Florida, Gainesville FL, 1987. "Box, Shrine and Sculpture," The Palladian Center, Vicenza, Italy, 1985. "Energy and the Garden," College of Architecture, University of Florida, Gainesville FL, 1983. "The Passive Garden," Environmental Center, Miami-Dade Community College, Miami FL, 1982. "New Age Gardens," Environmental Center, Miami-Dade Community College Miami FL, 1981. "Watercolor Graphics," LABash, National Conference of Landscape Architecture Students, University of Florida, Gainesville, March 2004. 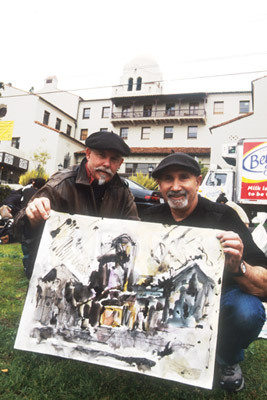 "Analytical Sketches," Representing the Designed Landscape Conference, University of California, Berkeley CA, November 2000. "Measuring, Drawing and Describing Italian Villas," Council of Educators in Landscape Architecture, Annual Conference, Arlington TX, Fall 1998. 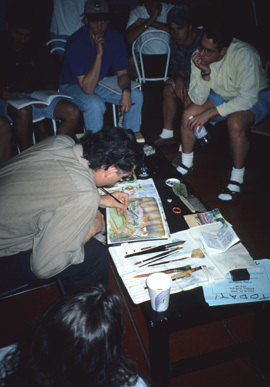 "Drawing and the Creative Process," The Design Communication Association Biennial International Conference, Tucson AZ, 1998. "Landscape as Art," American Society of Landscape Architects Annual Convention, Los Angeles CA, Fall 1996. "The Experimental Garden," part of Success in Design, the American Society of Landscape Architects State Convention, Florida Chapter, 1992. "Energy, Fantasy and Form," part of Outer Spaces, Environments We Can Live With, the American Society of Landscape Architects State Convention, California Chapter, 1992. "Landscape as Tattoo," Council of Educators in Landscape Architects Conference, Michigan State University, Lansing MI, 1991. "Garden as Icon," Avant Garde and the Landscape Conference, University of Minnesota, Minneapolis MN, 1989. "The Historical Garden as a Passive Solar Device," National Passive Solar Conference, Denver CO, 1989. "Energy, Meaning and Metaphysics of the Garden," Visions and Revisions Conference, University of Arizona, Tempe AZ, 1988. "Box, Shrine and Sculpture," Meanings of the Garden Conference, University of California, Davis CA, 1987.